10 Times Wild Classic Slot Guide & Review - Casino Answers! 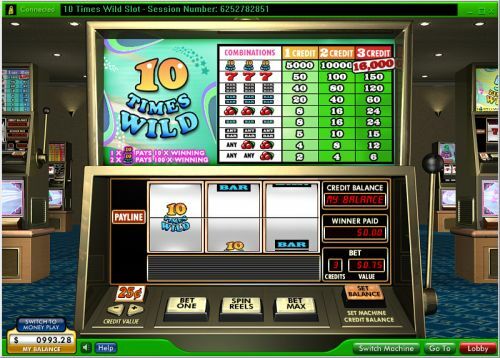 10 Times Wild is a 3-reel, 1-line classic slot machine developed by Random Logic, featuring a wild symbol and multipliers. You can play the 10 Times Wild classic slot machine at Bovada. Bets on the 10 Times Wild online slot machine are $0.05, $0.25, $0.50, $1 and $2. You can bet 1-3 coins per spin on the 10 Times Wild slot machine. 10 Times Wild is a nickel slot, so you can bet as little as a nickel per spin up to the highest total bet of $6 per spin. 10 Times Wild is perfect for casual players and even many high rollers. To play 10 Times Wild, you can select your bet and hit the “Spin Reels” button or hit “Play Max” to play the 3-coin maximum bet. The 10 Times Wild symbol is the highest paying symbol on 10 Times Wild. If you bet 3 coins on a spin and hit 3 of these symbols, you will win the 16,000 coin top jackpot. This is one of the largest top fixed jackpots around, especially for a classic slot machine. The 10 Times Wild symbol is of course wild and will substitute for all other symbols in the slot game. It will also act as a 10X or 100X multiplier when 1 or 2 symbols substitute in a winning combination. There are 9 winning combinations in the 10 Times Wild classic slot machine. The complete payout schedule is as follows (1/2/3 coin payouts in parenthesis): 1 Cherry symbol (2/4/6), 2 Cherry symbols (4/8/12), any 3 Bar symbols (5/10/15), 3 Single Bar symbols (8/16/24), 3 Cherry symbols (8/16/24), 3 Double Bar symbols (20/40/60), 3 Triple Bar symbols (40/80/120), 3 Seven symbols (50/100/150) and 3 10 Times Wild symbols (5000/10,000/16,000). The 10 Times Wild slot machine is all about the huge top payout and the generous multipliers. Beyond that, there isn’t much else and there doesn’t need to be. You can play 10 Times Wild when you sign up and deposit at Bovada. Where can I play more slots like 10 Times Wild? You can also play the 2 Times Wild, 2 Times Extra Wild and 5 Times Wild classic slot machines at Bovada.